Fountainhead Presents: Award Winning Finisterra Trio in Concert! We are happy and proud to welcome award winning Finisterra Trio at Fountainhead Gallery! Seattle Symphony violinist Brittany Boulding, cellist Kevin Krentz, Artistic Director of the Methow Valley Chamber Music Festival and pianist Tanya Stambuk, professor at University of Puget Sound will perform! 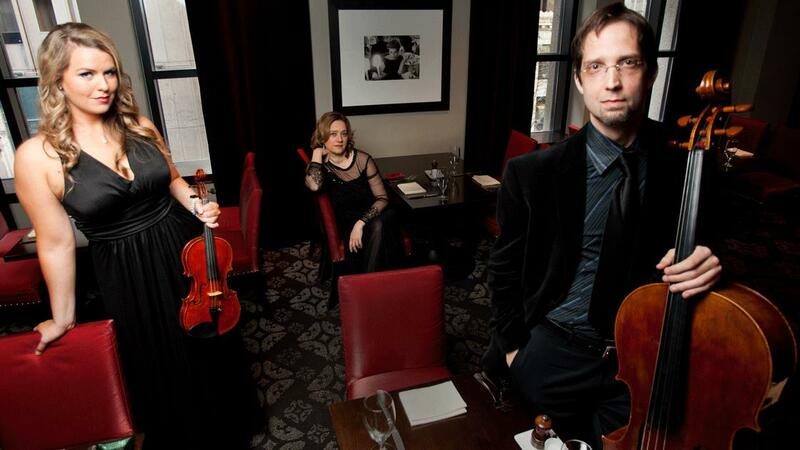 Finisterra Piano Trio has been thrilling listeners in the United States and abroad since 2003. Richard Lester of the celebrated Florestan Trio described Finisterra’s performances as “chamber music of the highest level.” Finisterra Trio will perform Dvorak's famous Dumky Trio and Paul Schoenfeld's vivid, dance-in-your-seats Café Music. We will enjoy listening to music against an exquisite background of paintings including Anne Belov's "believable fiction”, Bobbie Mueller’s "places of tranquility", Louise Britton's “landscapes as metaphor" and Anne Hayden Stevens' depictions of "challenges we all face.” See you all soon!